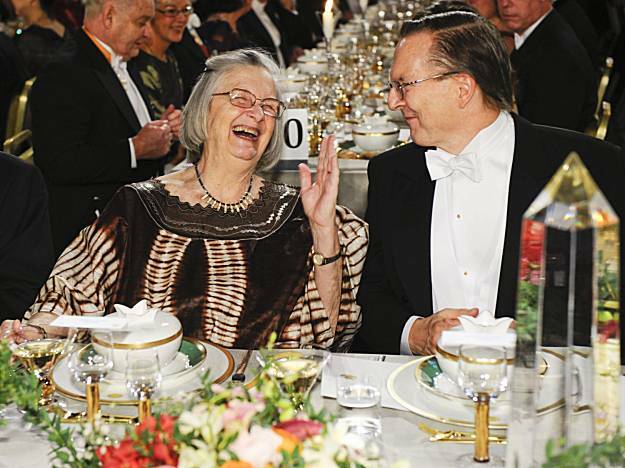 Nobel Prize laureate in Economic Sciences Professor Elinor Ostrom, left, laughs with Nobel Prize laureate in Medicine Professor Jack W. Szostak during the Nobel banquet in the Stockholm Town Hall, Thursday, Dec. 10, 2009. Ostrom, also the founding director of Arizona State University’s Center for the Study of Institutional Diversity, has devoted her career to studying the interaction of people and natural resources. “Until her work, the thinking was, ‘let the state intervene,'” said Paul Dragos Aligica, a political scientist at George Mason University. “‘If you leave it to individuals to do whatever they want, resources will be depleted.’ But she said `hold on’ and found that’s not the case.” Aligica wrote his doctorate under Ostrom’s guidance. I was so excited to read that Elinor Ostrom’s work was recognized by the Nobel Committee this week. Ms. Ostrom’s discoveries are not only groundbreaking in the field of Economics, but intricately linked to how we perceive our food systems. If her work proves that natural resources can be more effectively managed by individuals (those who live and work ON the land), then wouldn’t it follow that the fruits (or, in our case, meats) that come from those lands would also be better cultivated by those who grow them? The people whose livelihoods depend on the natural resources they manage will want to take care of the proverbial golden goose: the land, and ultimately its wonderful byproduct of good food. Our work at Morris Grassfed Beef includes managing roughly 5,000 acres of grazing lands (public and private) – land that Joe, Everett, Ben, Sarah and Jack work on a daily basis. They know where the water flows when it rains. They know the canyons that a lost calf would wander into. They know how a certain field responds after the herd has been in it for 24 hours. They manage the land in ways that they know will be beneficial for the native, perennial grasses needed to capture water and encourage oak seedlings. They are much better versed at how to rotate the herd or where to lay a pipeline or build a fence, than bureaucrats in Sacramento or Washington D.C. will ever be. Well managed common natural resources of sunlight, water, grass and cows produce the byproduct of this successful land management: grassfed beef. Cheers to Ms. Ostrom and the Nobel Committee for honoring the wisdom – and success – of the managers who have their “boots on the ground” and their hearts in the land. Elinor Ostrom, a Los Angeles native who teaches at Indiana University in Bloomington, Ind., became the first woman to win the prize for economics since it was first awarded 40 years ago. Ostrom, who received a doctorate in political science from UCLA in 1965, demonstrated how common natural resources such as pastures, woods and lakes could be successfully managed by user associations and other arrangements outside of government. She “has challenged the conventional wisdom that common property is poorly managed and should be either regulated by central authorities or privatized,” the Nobel economics committee said. The panel said Ostrom based her conclusion on case studies, including her own fieldwork that began with her doctoral dissertation that studied institutional entrepreneurship and saltwater intrusion into a groundwater basin under the Los Angeles area. She has conducted laboratory experiments and made use of other case studies, including research on grasslands in Mongolia that showed how nomad-dominated territories were better preserved by group-based governance than neighboring lands in Russia and China under central rule. p.s. I can’t help but also notice that Ms. Ostrom’s first name, Elinor, is shared by Joe’s grandmother, Elinor Baumgartner, to whom we owe our gratitude – along with Joe’s grandfather, J.J. Baumgartner – for leaving her beloved San Francisco to move to San Benito County and carry on his family’s long tradition of California ranching.